I hope that everyone had a great weekend! Sorry that I didn't get a post up yesterday, but I was enjoying a day off from...everything! On Saturday and Sunday, Shaun and I did lots of work around the apartment, including a complete makeover of our entryway coat closet. A few trips to Home Depot, a coat of BM's Stonington Gray, some new shelves, and we're in business for a sweet and spacious closet. Hurrah! But by Monday morn, I was pretty spent. Meanwhile, though I took the day off from life (and may have spent much of the afternoon catching up on Parenthood), I still managed to get myself in the kitchen to cook up a few things to share. With a bag of blueberries in my freezer (I bought them fresh and then realized that I don't actually like them unless in the form of a baked good), I had a jonesing for some blueberry muffins. And to make these healthy, I changed out a slew of ingredients. While these aren't exactly a dessert muffin, they are perfect for breakfast or on-the-go and are guilt-free to boot. Oh and I almost forgot to tell you that they are virtually sugar free too! Although we woke up to an inch of snow, I just had summer on the brain, so I brought out my sweet yellow baking cups which were not only cheery, but also mimicked the fresh lemon in the muffins. And I just love how the blueberries burst to make a pretty pattern seeping through. There's just something about lemon and berry that just reminds me of warm weather! Oh and I should mention that I'd never worked with whole wheat pastry flour before, but, while a bit grainy, they kept these muffins nice and light, rather than dense as regular ol' whole wheat flour would have. Preheat your oven to 400 degrees and line your muffin tin. I also like to set out all of my ingredients. In a large mixing bowl, lightly whisk the milk (I used almond, but any of your choice will do! ), Splenda, applesauce, honey, egg, vanilla, lemon juice and zest. With a wooden spoon, stir in the flour, baking powder and salt. Mix until just combined. Measure out and fold in the blueberries. Fill 12 muffin cups equally, about 3/4 full. Serve and enjoy immediately (or cool on a wire rack). These are great warm with a tiny bit of light butter and/or cinnamon sugar. Though these aren't sweet in the slightest (these are healthy muffins people! ), the blueberries give a burst of juicy flavor that I simply love. For a sweeter muffin, I recommend adding more Splenda blend or even a sugar topping. And to make this more decadent, substitute whole milk and oil for the almond milk and applesauce. So there you have it. 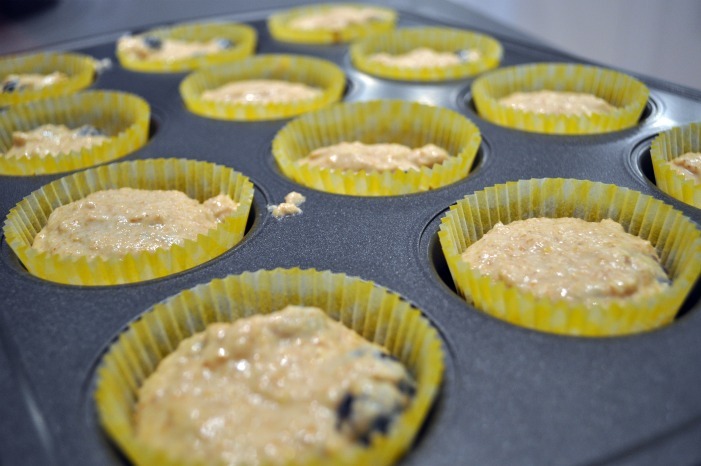 A healthy muffin that couldn't be easier to throw together. I will undoubtedly be enjoying one of these for breakfast tomorrow! So what do you think? What foods or flavors remind you of warm weather?